Now that the first semester is coming to a close, it is time to wrap-up the fall’s sports and their seasons. The team always has big shoes to fill with five NCAA National Championships, 16 NCAC Championships and 193 All-Americans. But specifically, after the 2017 season where they went undefeated until their final game in the Division III Football Championship playoffs against Frostburg. This season, the Tigers went 9-1. The season started off with a seven-game winning streak, conquering DePauw, Hiram, Kenyon, Denison and more, but their streak was thwarted by Wabash on Senior Day after they went into overtime and allowed the Little Giants to score. Rounding out their season, the Tigers took on Ohio Wesleyan and Wooster where they beat both teams. However, due to their loss to Wabash the Tigers did not head into the playoffs and concluded their season 9-1. The Tigers averaged 40.8 points per game, covered 480.1 yards, rushed 145.5 yards and passed for 284.6 yards. This season, the Tigers went head-to-head in 28 matches and walked away with 25 wins under their belts, going undefeated in conference play. Previously, the Tigers have been named the 2011 NCAA Division III National Champions and have won 23 NCAC Championships. The team fell only three times this season- the first to Christopher Newport in the ASICS Invitational, the second to Illinois Wesleyan and finally to Calvin in the NCAA Tournament. After conquering Kenyon and Hiram in the NCAC Semifinals, the Tigers headed to Grand Rapids to take on Carthage and DePauw. 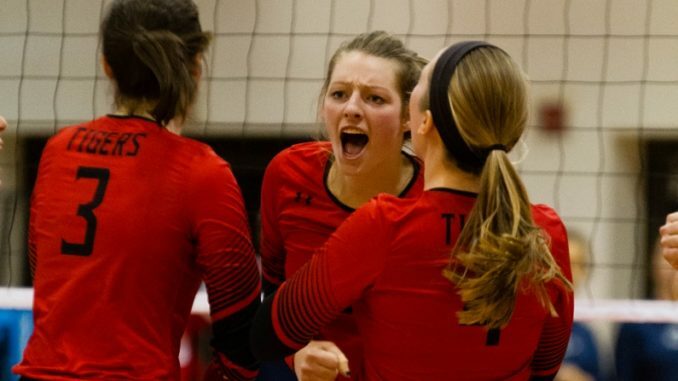 Winning all three sets against both the Torchies of Carthage and the Tigers of DePauw, Witt fell to Calvin in the third round of the NCAA Tournament. Throughout the season, the Tigers averaged 13.37 kills, 12.49 assists, 2.49 blocks, 1.49 service aces and 18.88 digs per set. Overall, the Tigers went 7-10- 1 this season compared to the 2017 season when their record was 5-12-1. At the conclusion of the season the Tigers had scored 25 goals and averaged 11 shots and 1.39 goals per game. The beginning of the season was tough for the Tigers after taking four losses and tying with Anderson at the Raven/Spartan Classic. But they took their first win against Mount St. Joseph during their home opener. The team rounded out their season with a final win against Hiram, which was one of two wins taken on the road for the Tigers. This season the Tigers went 6-9- 4, taking four of their six wins at home. Their first win of the season was taken at home against Wisconsin Whitewater, which was only the second game of the season for the Tigers. The season was a bit of a hodge-podge with wins to losses and ties. This season the Tigers had four ties, which was one more than the 2017 season, against Baldwin Wallace, Kenyon for the Alumni Game, Allegheny and Hiram on Senior Day. The game following their tie with Hiram, the Tigers took on Denison in the NCAC Semifinal and won 2-1 in overtime. Moving on to the NCAC Tournament Championship Match against Wooster, the Tigers took their final loss 4-0. The team averaged 10.7 shots and .84 goals per game, scored 16 goals and went 3-2-3 in conference play. This season, the Tigers competed in 18 games and went 7-11. Overall, this season was a tough one for the team. Their home opener started off the season with a loss to Washington & Jefferson, but the Tigers turned it around the following game with a win against Earlham. The Tigers made it to the NCAC Semifinals after three consecutive wins against Kenyon, DePauw and Ohio Wesleyan. The final game of the season for Witt came at Denison, where the Tigers lost 3-0. In total, the Tigers drew seven green cards this season. They averaged 11.1 shots and 1.8 goals per game. Through 18 games, the Tigers scored 32 goals and went 7-7 in conference play. Now that the fall has been closed out, keep a look out for Men’s and Women’s Basketball, Men’s Volleyball, Women’s Water Polo, Men’s and Women’s Swimming and the Track and Field teams as they begin to compete for their 2018-2019 seasons.